Helene and Louis Althusser were a French married couple, Louis was a professor of philosophy specialising in Marxist thought. Tragically Louis suffered from occasional episodes of mental illness and during one of these he killed his wife. He was diagnosed as suffering from diminished responsibility and was not tried for the killing but committed to a psychiatric hospital. 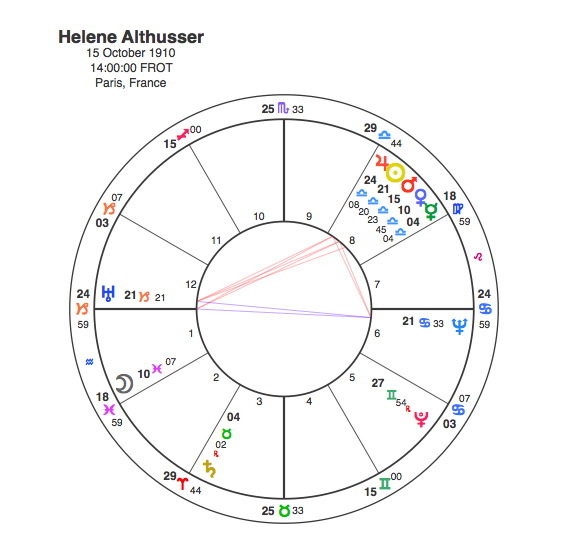 Helene’s chart has one striking similarity to that of Margaret Thatcher, they both have a Sun / Mars conjunction in Libra at the point focal point of a Tsquare. The similarity ends there as Helene’s conjunction is part of a concentrated grouping of five planets in the 8th house ( an area of the birthchart that is traditionally associated with death ). The Tsquare is extremely powerful because the planets in opposition, Uranus and Neptune ( both blue coloured in the chart ) are at 21 degrees of Capricorn and Cancer, the same as the Sun at 21 Libra. The Tsquare also involves the Ascendant at 25 Capricorn and therefore the 7th house cusp. An opposition across the horizon line in a chart would tend to suggest an aspect of tension between marriage partners. The fact that this opposition focuses onto a conjunction in the 8th house of the Sun and Mars in Libra could easily symbolise being killed by or at least violence at the hands of the marriage partner. 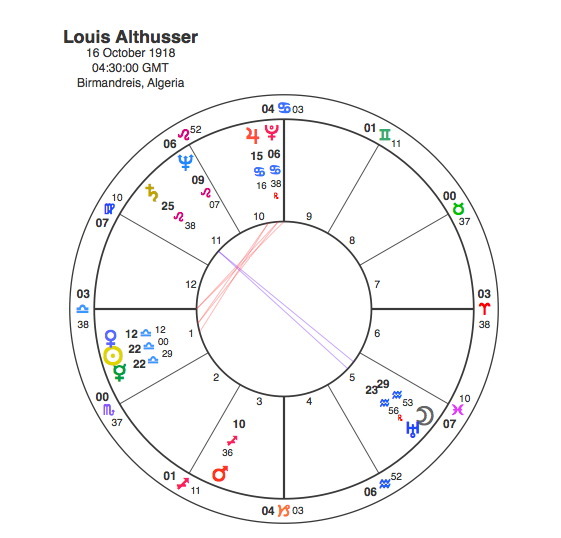 Louis had the Sun and Ascendant in Libra and the Moon in another Air sign, Aquarius. He was an intellectual, and with that much Libra it would be hard to imagine him killing anyone. The Moon in Aquarius conjunct the unconventional Uranus would probably account for his left wing politics. The Moon rules ones feelings, emotions and instinctive reactions and it does receive a difficult opposition aspect to Saturn which may go someway to explain the episodes of mental illness. Helene and Louis both have the Sun in the 22nd degree of Libra and they had a close relationship and similar outlook on life. The only problem with sharing the same degree of the Zodiac is that they would both be affected by the same transits at the same time. Louis killed Helene in 1980. Pluto was at 21 – 22 degrees Libra in 1980 and in conjunction with both of their Sun’s. The single most powerful event in their lives was sudden and unexpected in the way that Pluto transits often are. It was the only aspect that Pluto made with either of their Sun’s throughout their lives. One life was ended by it and the other defined by it.